Demolition Man is a 1993 American science fiction action film that was Marco Brambilla’s directorial debut. The film stars Sylvester Stallone and Wesley Snipes. The film was released in the United States on October 8, 1993. The film tells the story of two men: an evil crime lord and a risk-taking police officer. Cryogenically frozen in 1996, they are reanimated in 2032 to find mainstream society changed and all crime seemingly eliminated. In 1996, psychopathic career criminal Simon Phoenix kidnaps a number of hostages, and takes refuge with his gang in an abandoned building. LAPD Sgt. John Spartan uses a thermal scan of the building; finding no trace of the hostages, he leads an unauthorized assault to capture Phoenix. Phoenix sets off a series of explosives that demolish the building, and the hostages’ corpses are found in the rubble; Phoenix claims Spartan knew about the hostages and attacked anyway. Both men are incarcerated in the city's new "California Cryo-Penitentiary", where they are cryogenically frozen and exposed to subliminal rehabilitation techniques. In 2032, Phoenix is thawed for a parole hearing and he escapes. Lieutenant Lenina Huxley has Spartan thawed to help stop Phoenix. She explains to Spartan that San Angeles—a metropolis that combines the former Los Angeles, San Diego, and Santa Barbara—is a peaceful utopia, and the police are no longer equipped to deal with violent crime. Spartan finds the new future depressing and oppressive; human behavior is tightly controlled, physical contact and swearing are illegal, and anything else deemed "bad" is also banned. Likewise, others on the police force find Spartan's behavior brutish and uncivilized. Spartan anticipates that Phoenix will attempt to secure firearms. He and Huxley head to a museum and find Phoenix already there. Phoenix escapes with the weapons and encounters Dr. Raymond Cocteau, the evangelistic pseudo-pacifist who has been running San Angeles since the "Great Earthquake" of 2010. To his confusion, Phoenix finds that he is unable to shoot Cocteau, who reveals that he had orchestrated Phoenix's escape all along. As a safety measure, Cocteau implanted a command that prevents Phoenix from harming him. Cocteau wants Phoenix to assassinate Edgar Friendly, the leader of a resistance group called the Scraps that resists his rule. Spartan and Huxley witness this exchange on security cameras and review the cryo-prison records. To their shock, they find that Phoenix's rehabilitation program has been replaced with combat training programs and the information necessary for his escape. Spartan meets with the Scraps in time to ward off an attack by Phoenix and other criminals who have been thawed out of cryo-sleep to help assassinate Friendly. Phoenix taunts Spartan, revealing that he had killed the 1996 hostages before setting off the bomb, meaning Spartan has spent 36 years in prison for no reason. Phoenix escapes, and Spartan arms himself with help from the Scraps. Phoenix returns to Dr. Cocteau with his men, and has one of them kill Cocteau. They return to the cryo-prison and begin to thaw out more convicts. Spartan enters the prison alone to fight Phoenix, heavily damaging the facility in the process; he uses the cryogenic chemical to freeze and kill Phoenix. Spartan escapes the prison as it explodes. The police fear that the loss of Cocteau and the cryo-prison will end society as they know it, but Spartan suggests that they and the Scraps work together to combine the best aspects of order and personal freedom. He then kisses Huxley and the two go off together. Sylvester Stallone as Sergeant John Spartan. Originally, Jean-Claude Van Damme and Steven Seagal were offered lead roles in the film, but both turned it down. Wesley Snipes as Simon Phoenix. The role of Phoenix was also offered to Jackie Chan, but he turned it down, not wanting to play a villainous character. Sandra Bullock as Lieutenant Lenina Huxley. Lori Petty was originally cast as Huxley, but was replaced by a then relatively unknown Sandra Bullock after two days of filming due to what producer Joel Silver described as "creative differences". The character was named after Aldous Huxley, the author of Brave New World, and Lenina Crowne, a character in Brave New World. General Motors provided the production team with 18 concept vehicles, including the Ultralite. More than 20 fiberglass replicas of the Ultralite were produced to portray civilian and SAPD patrol vehicles in the film. After filming had completed, the remaining Ultralites were returned to Michigan as part of GM's concept vehicle fleet. The film featured the actual demolition of one of the buildings of the famed, no longer operative Belknap Hardware and Manufacturing Company in Louisville, Kentucky. One of the film's focal points is Taco Bell being the sole surviving restaurant chain after "the franchise wars." Because Taco Bell does not hold a wide presence outside the U.S., the European version of the film substitutes it with Pizza Hut (another Yum! Brands chain), with lines re-dubbed and logos changed during post-production. The film mentions Arnold Schwarzenegger having served as President of the United States, after a Constitutional amendment was passed allowing him to run for the office due to his popularity. Coincidentally, a day short of exactly ten years after the film's release, the California gubernatorial recall election was scheduled. The election saw Schwarzenegger actually begin a political career as the 38th Governor of California from 2003 until 2011. Shortly after he was elected, an "Arnold Amendment" did get proposed. Hungarian science fiction writer István Nemere says that most of Demolition Man is based on his novel Holtak harca (Fight of the Dead), published in 1986. In the novel, a terrorist and his enemy, a counter-terrorism soldier, are cryogenically frozen and awakened in the 22nd century to find violence has been purged from society. Nemere claimed that a committee proved that 75% of the film is identical to the book. He chose not to initiate a lawsuit, as it would have been too expensive for him to hire a lawyer and fight against major Hollywood forces in the United States. He also claimed that Hollywood has plagiarized works of many Eastern European writers after the fall of the Iron Curtain, and that he knows the person he claims to be responsible for illegally selling his idea to the filmmakers. The title theme is a heavier remix of the song originally recorded by Grace Jones and written by Sting during his time as frontman for The Police. The song was first released in March 1981, as an advance single from Jones's fifth album, Nightclubbing. Sting released an EP featuring this song and other live tracks, entitled Demolition Man. Elliot Goldenthal composed the score for the film. It was his second big Hollywood project after the Alien³ score. In 2017, Sylvester Stallone's loan-out company filed a lawsuit against Warner Bros. over the disbursement of profits from the film. The film debuted at No. 1 at the box office. 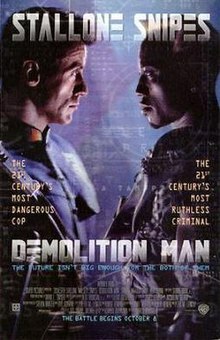 Demolition Man grossed $58,055,768 by the end of its box office run in North America and $159,055,768 worldwide. Audiences polled by CinemaScore gave the film an average grade of "B" on an A+ to F scale. Warner Bros. released it on VHS in March 1994, on DVD in October 1997 and 2014, and on Blu-ray in August 2011. Rotten Tomatoes gives the film a 61% rating based on 38 reviews. The site's consensus reads: "A better-than-average sci-fi shoot-em-up with a satirical undercurrent, Demolition Man is bolstered by strong performances by Sylvester Stallone, Wesley Snipes, and Sandra Bullock." The film scored a 34/100 on Metacritic based on 9 reviews. Kenneth Turan of the Los Angeles Times wrote that the film fails to give actions fans what they desire, instead substituting out-of-place satirical commentary. Vincent Canby of The New York Times called it "a significant artifact of our time or, at least, of this week". Richard Schickel of Time wrote, "Some sharp social satire is almost undermined by excessive explosions and careless casting." A four-part limited-series comic adaptation was published by DC Comics starting in November 1993. A novelization, written by Robert Tine, was also published in November 1993. Acclaim Entertainment and Virgin Interactive released Demolition Man on various home video game systems. The 16-bit versions were shooting games distributed by Acclaim. The 3DO version is a multi-genre game that incorporates Full Motion Video scenes, with both Sylvester Stallone and Wesley Snipes reprising their roles as their characters in scenes that were filmed exclusively for the game. In April 1994, Williams released a widebody pinball machine, Demolition Man based on the movie. It is designed by Dennis Nordman. The game features sound clips from the movie, as well as original speech by Stallone and Snipes. This game was part of WMS' SuperPin series (Twilight Zone, Indiana Jones, etc.). To celebrate the film's 25th anniversary, Taco Bell recreated the 2032 San Angeles version of their restaurant at the 2018 San Diego Comic-Con. ^ Goldstein, Patrick (August 1, 1993). "Hollywood's Big-Bang Theorist". The Los Angeles Times. Retrieved September 19, 2010. ^ "DEMOLITION MAN (15)". British Board of Film Classification. Retrieved March 15, 2018. ^ a b Galbraith, Jane (October 12, 1993). "Hoping for a Box Office Blowout on 'Demolition Man'". The Los Angeles Times. Retrieved March 15, 2018. ^ a b "Demolition Man – Box Office Data, Movie News, Cast Information". The Numbers. Retrieved June 1, 2010. ^ Wong, Stacy (April 16, 1993). "Irvine Cast as Futuristic L.A. : Movie: Action-thriller starring Wesley Snipes and Sylvester Stallone is being filmed in the city this week". The Los Angeles Times. Retrieved November 8, 2010. ^ a b James, Caryn (October 24, 1993). "FILM VIEW; 'Demolition Man' Makes Recycling an Art — The". New York Times. Retrieved March 9, 2009. ^ "The Jean-Claude Van Damme/Steven Seagal Movie That Never Will Be...'Demolition Man'". MTV. March 3, 2008. Retrieved May 16, 2011. ^ Dickerson, Jeff (April 4, 2002). "Black Delights in Demolition Man". The Michigan Daily. Archived from the original on December 24, 2007. Retrieved September 19, 2010. ^ Ayscough, Suzan (March 18, 1993). "Bullock in for Petty on 'Man'". variety.com. Retrieved August 3, 2016. ^ Marin, Rick (November 21, 1993). "UP AND COMING: Rob Schneider; Call Him Busy. He's the Smarminator". The New York Times. Retrieved August 23, 2014. ^ "How Many Ultralite Concept Vehicles Were There?". GM Heritage Center. Retrieved January 8, 2012. ^ "Demolition Man (Comparison: US Version - European Version)". Movie-Censorship.com. Retrieved April 16, 2015. ^ Hertzberg, Hendrik (September 29, 2003). "Strongman". The New Yorker. Retrieved October 23, 2017. ^ "Nemere István: A cenzúra a fejekben van". Origo.hu (in Hungarian). Retrieved November 28, 2010. ^ Mumford, Gwilym (April 13, 2017). "Sylvester Stallone sues Warner Bros for 'dishonesty' over Demolition Man profits". The Guardian. Retrieved July 11, 2017. ^ Fox, David J. (October 12, 1993). "Weekend Box Office Stallone, Snipes: Action at Box Office". The Los Angeles Times. Retrieved October 27, 2010. ^ Fox, David J. (October 19, 1993). "Weekend Box Office : 'Demolition Man' Fends Off 'Hillbillies'". The Los Angeles Times. Retrieved December 30, 2010. ^ Horn, John (October 15, 1993). "Demolition man' explodes into charts at no. 1". Chicago Tribune. Retrieved September 19, 2010. ^ Hunt, Dennis (March 4, 1994). "'Fugitive' Runs Home : Movies: Even though the hit film is back in theaters, Warners rushes its video release on the heels of Oscar nominations". Los Angeles Times. Retrieved November 23, 2014. ^ "Action On DVD and Blu-ray 1997". MovieWeb. Archived from the original on November 23, 2014. Retrieved November 23, 2014. ^ Zupan, Michael (August 25, 2011). "Demolition Man (Blu-ray)". DVD Talk. Retrieved November 23, 2014. ^ "Demolition Man". Rotten Tomatoes. Retrieved October 2, 2017. ^ "Demolition Man Reviews". Metacritic. Retrieved June 7, 2014. ^ Turan, Kenneth (October 8, 1993). "Demolition Man: Another Killer Blond". Los Angeles TImes. Retrieved September 10, 2010. ^ Canby, Vincent (October 8, 1993). "Review/Film; Waking Up In a Future Of Muscles". The New York Times. Retrieved September 10, 2010. ^ Schickel, Richard (October 18, 1993). "Futuristic Face-Off". Time Magazine. Retrieved September 19, 2010. ^ Tine, Robert (November 25, 1993). Demoliton Man. Signet Books. ISBN 0451180798. Retrieved January 27, 2019. ^ "Demolition Man". GamePro. No. 76. IDG. January 1995. p. 192. ^ Salemme, Danny (July 3, 2018). "Taco Bell Recreating Demolition Man Restaurant At SDCC 2018". Screen Rant. Retrieved July 4, 2018.